Australian Universities' Review Vol. 44, Nos. 1&2, 2001, pp. 37-38. Brian Martin is an associate professor in Science, Technology and Society at the University of Wollongong, in Australia. He has a PhD in theoretical physics from the University of Sydney. The PhD is the accepted apprenticeship into research and has become a prerequisite for academic jobs in most fields. But is it a good idea? The negative view is that studying for doctorates wastes vast amounts of time and effort, produces narrow-minded scholars and discourages recognition of good teaching. Far from promoting research, according to this critical view the doctorate is a serious brake on intellectual creativity. These sentiments are seldom voiced publicly by academics, most of whom have a vested interest in the doctoral system, having themselves obtained PhDs and trained a succession of graduate students. So it is not surprising that Wilfred Cude, author of this powerful exposé, is not a tenured academic. A Canadian literary scholar, Cude has personal experience of bias in the academic system. Being denied a PhD and a permanent job, he has eked out a precarious career as a casual teacher, yet continuing to do research. He self-published The Ph.D. Trap in 1987 and eventually found a mainstream publisher for The Ph.D. Trap Revisited, which is updated and double the size. Cude opens his attack with some alarming statistics. In 1995 in the United States, the average physical scientist PhD graduate had been enrolled in graduate school for 6.9 years and chronologically had spent a total of 8.4 years from beginning to end. For social sciences the figures were 7.5 and 10.5 years and for humanities 8.4 and 12.0 years. Over the previous several decades, these figures had grown considerably. Cude notes that in some fields, the average PhD graduate is nearly middle-aged, having spent what should have been some of the most creative and productive years in pursuit of a qualification of marginal intellectual value. In Canada and the US, PhD candidates spend years in coursework and preparation for qualifying examinations before undertaking a dissertation, making the process longer than in Australia. Yet many Australian readers will recognise the syndrome of the seemingly perpetual research student. The waste involved in slow progress is one thing, but pales by comparison with the wasted effort and disillusionment of those who drop out along the way. Is there a better way? Cude takes a broad view in examining the problems with the PhD. He surveys the evolution of universities over the past couple of centuries, noting how changes in training reflected economic, political and cultural influences. He quotes eminent commentators, such as William James and Thorstein Veblen, who were critical of the PhD in its very early days. He then turns his attention to shortcomings among tenured academics, describing various types of unethical behaviour. The most striking case is that of engineering professor Valery Fabrikant of Concordia University who murdered four colleagues in 1992. A subsequent investigation revealed various forms of inappropriate behaviour and poor policy in the department and university. Fabrikant was guilty but he operated in an environment of dubious ethics. Cude also describes methodological conflicts in universities, such as Yale mathematician Serge Lang's attack on prominent Harvard political scientist Samuel Huntington (Lang, 1998). What does all this have to do with the PhD? Cude is trying to show that the route to the doctorate is not just a matter of careful and conscientious scholarship, but also involves traversing a political and ethical swamp, due to improper behaviour and methodological confusion among academics, who have enormous power over PhD students. Indeed, those intrepid graduate students who challenge the decisions of their supervisors are in for a rough ride indeed, as evidenced by the legal travails of University of Toronto philosophy student Eric P. Polten, who possibly learned more law than philosophy through his challenges to his advisory committee. Despite having his dissertation published as a book in the Netherlands to laudatory reviews, the committee refused to pass it. Other frustrated PhD students have taken more drastic action, in a few cases murdering their supervisors. On the positive side, Cude gives examples of scholars, such as economist Kenneth Boulding, who have made seminal contributions despite never having undertaken a PhD. Cude argues that, in terms of developing oneself intellectually, a second master's degree may be better than a PhD. He is severely critical of tenure as protecting non-productive time-servers, and favours internships to support gifted teachers without doctorates. The Ph.D. Trap Revisited is engagingly written and draws on a wide range of relevant literature, such as Randall Collins' The Credential Society (1979) and Bill Readings' The University in Ruins (1996), indeed serving as a useful introduction to both classic and more recent works in the genre of university criticism, especially criticism oriented to the humanities. What does Cude recommend? Here he can but offer advice, given the lack of any movement for fundamental reform of higher education along his preferred lines. To prospective PhD students, he advises caution and careful consideration of alternatives, lest years be wasted on a futile and soul-destroying quest. To those very few tenured academics who are willing to scrutinise the PhD system, he recommends supporting reforms. To people outside the university, he advocates action, because universities won't change on their own: "while the best students shun the doctorate in the humanities and social sciences, while many other good students are lured into frustration and failure in those disciplines, and while the formal analysis of our most urgent social, cultural and ethical problems passes more and more into the hands of conformist and doctrinaire thinkers, the universities will for the most part remain silent" (p. 310). Cude goes easy on the sciences, accepting the PhD there as comparatively benign. Yet a powerful critique can also be mounted against research degrees in the sciences, as shown by Jeff Schmidt in Disciplined Minds (2000). The Ph.D. 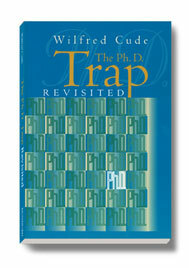 Trap Revisited deserves attention because Cude, unlike most of the other thousands of failed aspirants who are spit out by the higher education system each year, retains his voice, and an eloquent and measured one at that, with scarcely a hint of his personal struggles. His critical commentary will be uncomfortable reading for many academics who do not want to imagine that, except for good fortune, they might have ended up in the academic scrap heap. It would be both courageous and honourable to give a copy of the book to beginning PhD students. If they then decide to proceed, at least they will do so with open eyes. Collins, Randall (1979), The credential society: An historical sociology of education and stratification, New York, Academic Press. Lang, Serge (1998), Challenges, New York, Springer-Verlag. Readings, Bill (1996), The university in ruins, Cambridge, MA, Harvard University Press. Schmidt, Jeff (2000), Disciplined minds, Lanham, MD, Rowman & Littlefield.